From Earth we can study the optical and radio wavelengths fairly easily. We can see a little infrared in precision observatories and a miniscule fraction of ultraviolet - this is what gives us a tan in the sun. The light that we see from stars is just one form of observing we can do. 'Invisible' astronomy or 'non-optical' astronomy tells us a lot about space. Special observing techniques have been produced in order to study bodies best at different parts of the spectrum as our atmosphere is good at deflecting or blocking these waves, which is a good thing or the rays would kill us! Oxygen allows humans and animals to breathe. The atmosphere holds in some "greenhouse" gases that retain the heat of the Sun. These are necessary for life to continue on Earth however gases made as a result of human actions are causing the atmosphere to heat up which causes climate change. The atmosphere reflects most radiation making observations at some wavelengths weaker. Why are some types of light and radiation visible to us (e.g radio waves) from Earth and not others (e.g. X-rays)? The atmosphere is made up of Nitrogen, Oxygen and other gases such as Argon and Carbon Dioxide. There is more atmosphere on the surface near the sea than on top of a very tall mountain. Gravity is stronger the nearer it is to the Earth's centre. 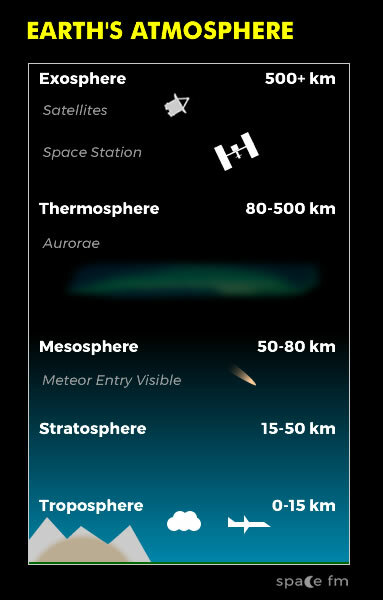 Atmosphere thins out the further it is from Earth to the point where it merges with space. Ask an astronomer What are the advantages and disadvantages of using a telescope in space? EarthSky What is the electromagnetic spectrum?